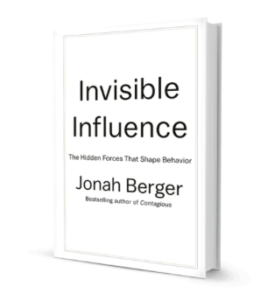 After I finished reading Invisible Influence: The Hidden Forces that Shape Behavior by Jonah Berger (in it, he explores the subtle influences which affect the decisions we make re shopping, careers, etc. ), I had the pleasure of exchanging a few words with Jonah. Jenan: You underline the importance of design as an influencer, in life and business, in a number of stories throughout your new book. When done right, design can and does encourage people to purchase a product and/or change their behaviour. Can you suggest some simple ways for companies to poke holes in the design of their thingamajigs in an effort to make the design stronger? Jonah: One simple way for companies to poke holes in their designs is to see things through the eyes of the customer. Too often companies build things that look great, or have great technology, but don’t actually meet the customer needs. Always be customer focused rather than product focused. Don’t just sell what you can make, make what you can sell. Start form the customer insight and a deep understanding of their needs and use that to build and design your offering. Jenan: Thank you, Jonah, and all the best until next time!